Endeavour Harbour was a wonderful spot with only a couple of tripper boats visiting each afternoon to disturb the peace. There was also a pair of young osprey in residence who liked to sit on top of one of the yachts' masts. They were clever enough to work out that if they chose a yacht without a dinghy in tow the owner was probably elsewhere and they would be undisturbed. 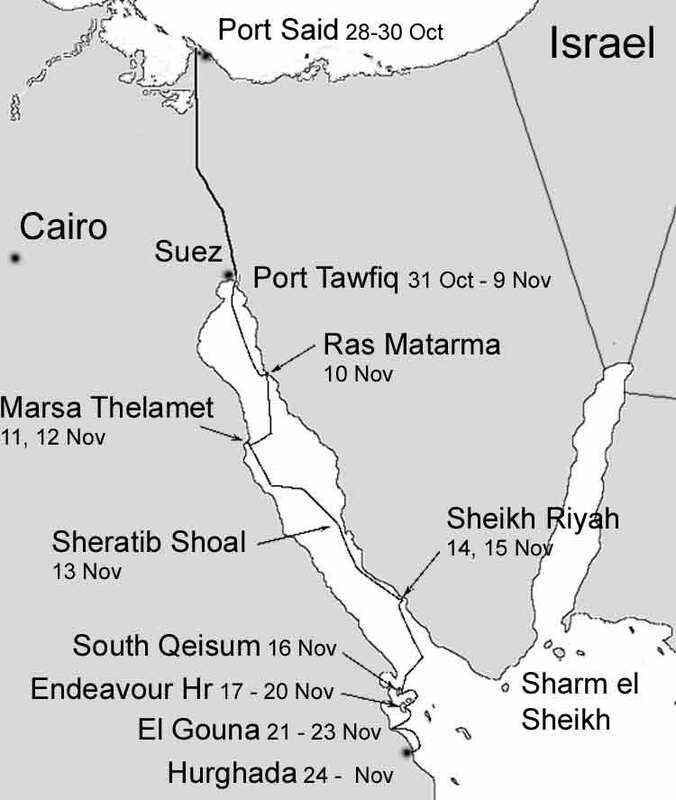 On Wednesday (21st November) we left for Abu Tig marina and had a pleasant sail negotiating our way around various reefs. 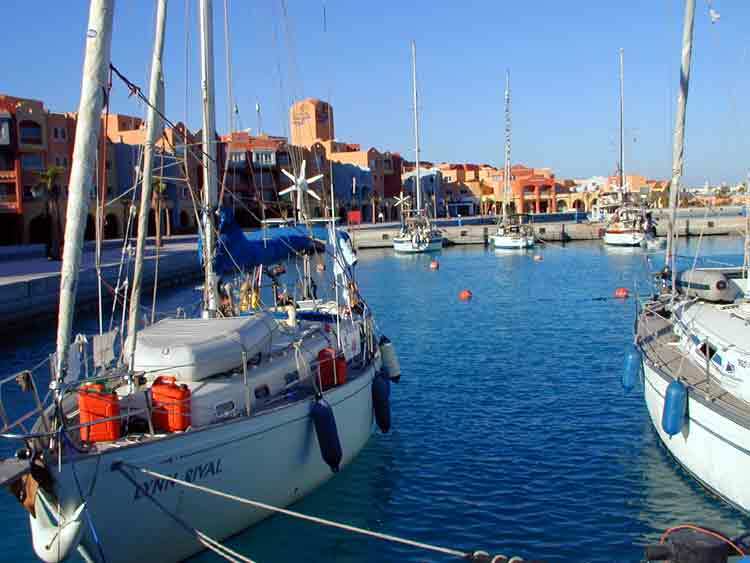 The marina is part of the El Gouna resort complex, built and run to European standards. The contrast with our experience of Egypt so far was startling. There were restaurants, shops and bars providing international cuisine, alcohol and designer label goods for an up-market clientele who come to play golf, dive, etc. We enjoyed the excellent pizzas at one of the Italian restaurants but otherwise found it a very sterile environment. While at El Gouna we hired diving equipment and spent a day finishing off our dive training just outside the marina. After demonstrating the various skills we had learnt, we had a chance to look at some of the coral reefs and began to appreciate the fun of being under the water among the fishes. But at the end of the day we were really exhausted. A problem with diving is all the preparation and heavy equipment involved. We met a few other yachties in Abu Tig who were using the marina as their base for cruising all year round in the Red Sea. The marina was well run but we found it hard to imagine staying there for more than a few days. On Saturday we escaped and had another good sail, along with a number of other rally boats that had visited El Gouna, to reach Hurghada marina. Hurghada marina is a large new facility which offers safe mooring but the surrounding facilities are still being completed. The staff are very helpful and the town is not far so we don't mind being in something of a building site. Hurghada is a major resort and stretches along the coast a long way. It's an odd mix of upmarket hotel complexes, streets with downmarket tacky tourist shops, areas with low-rise shacks where the Egyptians live, and streets with the usual grubby Egyptian shops, cafes and markets. Hurghada is very popular with the Russians and Russian rather than English signs are common. The rally yachts will be in Hurghada for a week. It's a convenient place for visiting the Nile Valley so quite a few of us are off to Luxor in the next day or two. We will also take the opportunity to stock up here as we don't expect to be able to get fresh provisions for the next four weeks after leaving here. We did see some Christmas decorations for sale in a shop here today, a reminder of what we're missing. The nights are now getting quite cold and one surprise in Hurghada was to find that the mosquitos are not put off by the cold weather.